1) Kendra Scott 'Morgan Stud Earrings', Nordstrom, $65 : This first one is a bit of a splurge, but I used it as inspiration towards the other earrings I chose for this post, so it deserves a spot up here. The iridescent look is still pretty big when it comes to accessories, and I think this is a great classic take on the look. Plus, with all the colors it reflects, it goes with almost anything! The size is also pretty large, allowing it to be a focal point to any outfit. I'd definitely consider saving money in the piggy bank for this one. 2) Lavender Hexagon Crystal Earrings, Max & Chloe, $14 : The hue of the purple in this earring is great for upcoming spring barbecues and get-togethers. The hexagon is very prominent in itself, but the embellishments along the sides really bring these studs up a notch. 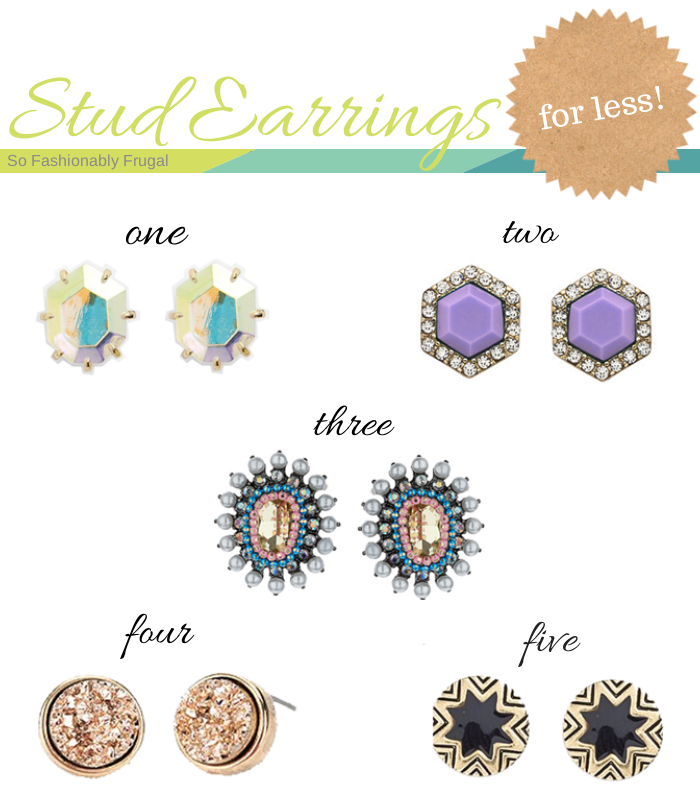 3) Oval Stone Stud Earrings, Topshop, $18 : These earrings are super luxe for their price and have a lot going on with them! Make them a focal piece to your outfit, or mix them with fun prints and patterns. I vote for tribal print! 4) Druzy Stone Earring, Urban Outfitters, $16 : I've seen earrings that look like this on Etsy for around $40, so I was really impressed by the price of these. They look like they're worth much more! I think they'd be perfect with a chambray shirt, striped skirt and heels. 5) House of Harlow 1960 'Sunburst Engraved Stud Earrings', Nordstrom, $28 : I love House of Harlow line just because of the obsession with geometric shapes! Contemporary and edgy, these earrings can easily become a focal point to your outfit. Don't let the size here fool you! They are pretty large! Wishing you a wonderful week and as always, happy frugal shopping!